Divers Lodge Lemben is a small resort on the south end of Lembeh Island devoted to providing customized services for its guests. Underwater photographers who visit Divers Lodge Lembeh will want to book an unlimited diving packaage which includes Nitrox fills, a private boat and guide (for 1-2 divers), accommodation in a private bunglow with good views over the sea (and for some volcanos!). Single divers / underwater photographers are welcome. Divers Lodge currently has 6 cottages. All have private bath (hot & cold water), a desk for working on cameras (they will set up another if 2 photographers in the room). We depart April 30 aboard the liveaboard SMY Ondina for our dive/photo cruise from Lembeh Strait to Halmahera and Raja Ampat. The ship will pick up guests for that trip at the resort, so no drying or packing required! I chose this resort for my small group of underwater phtoographers (and for individuals too) for 4 reasons.. the size ... the ratio of boats/divers.. the ratio of guides/divers.. plus the unlimited diving (and free Nitrox). It doesn't hurt that people I've sent there came back with rave reviews and extended their stay as long as possible. Their boats are comfortable. Shaded and with a toilet and shower. I understand you can even charge batteries aboard some of them. They look to be the best dive boats in Lembeh. BTW, there is no reason to dive Lembeh from a liveaboard. 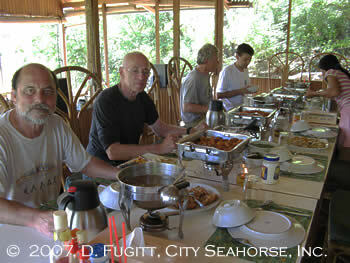 You can get more diving, more comfort and more great photos during a stay at Divers Lodge Lembeh. The resort is at the end of Lembeh Island, right across from Bitung. So, you can choose to go muck diving in the Strait, or go the other way (weather permitting) and do some reef diving. Also understand they have some Mandarianfish right outside the resort (and no surcharge!! for the Mandarianfish dive). All the comfortable and very private, but not luxurious, bungalows face seaward and have great views over the southeast end of the island.. which they own, so it is pretty hills and a nice bay. 1 or 2 bungalows have views in both directions (toward N. Sulawesi and the volcanos). The staff will carry your cameras to and from the boat for you. Tarsiers live on the property. We saw them when we were there in May! They claim to have more birds there than in Tangkoko.. but I'll never be able to verify that! The food is good. Not fancy but very tasty and served at one long table in the dining/lounge building. Downside? The "pool" is only the inflatable one used for the kids. 1076 euro (US$1455) per person for a single cottage. Please email if you are interested either in joining one of our groups of EXTEMELY wonderful photographers, or in a booking for yourself, you and your buddy, or a small group. This is a very small resort and we can only take 9 divers for the week there. We depart April 30 for our dive/photo cruise in Raja Ampat aboard the liveaboard SMY Ondina. The trip will be geared toward best photography experiences. If you've been on one of our trips before, you know that our guests are the best! There is room for only 11 guests total (including Tony and I) at this tiny resort. The resort has 6 cottages, 5 boats and 6 dive guides.. lots of personal attention. I chose this resort for 4 reasons.. the size (we can have the whole place)... the ratio of boats/divers.. the ratio of guides/divers.. plus the unlimited diving (and free Nitrox). It didn't hurt that people I've sent there came back with rave reviews and extended their stay as long as possible. Their boats are comfortable. Shaded and with a toilet and shower. I understand you can even charge batteries aboard some of them. This Lembeh Strait trip should be a lot of fun. I see us splitting up different ways every day depending on what people what to do. The resort is at the end of Lembeh Island, right across from Bitung. So, you can choose to go muck diving in the Strait, or go the other way (weather permitting) and do some reef diving. Also understand they have some Mandarianfish right outside the resort (and no surcharge!! for the Mandarianfish dive). All the comfortable and very private, but not luxurious, bungalows face seaward and have great views over the southeast end of the island.. which they own, so it is pretty hills and a nice bay. 1 or 2 bungalows have views in both directions (toward N. Sulawesi and the volcanos). The staff will carry your cameras to and from the boat for you. The food is good. Not fancy but very tasty and served at one long table in the dining/lounge building. Downside? The "pool" is only the inflatable one used for the kids. 1076 euro (US$1455) per person for a single cottage (only 1 available). These rates are based in euros. The price in your home currency (if not euros) will vary until paid in full. 25% deposit required to confirm a booking on this trip. Priority for this trip goes to divers scheduled on the April 30-May 12 Raja Ampat Charter, however I should have some space available for others. Please email if you are interested.